Sherpa/Coach/Be a Good Friend duty at Austin, Texas Ironman 70.3 Sunday. Athletes swim 1.2 miles in Decker Lake, bike 56 miles through rolling Texas farmlands, and run 13.1 mile around Luedecke Arena. The morning was perfect with wetsuit legal waters, low wind, and gorgeous skies. 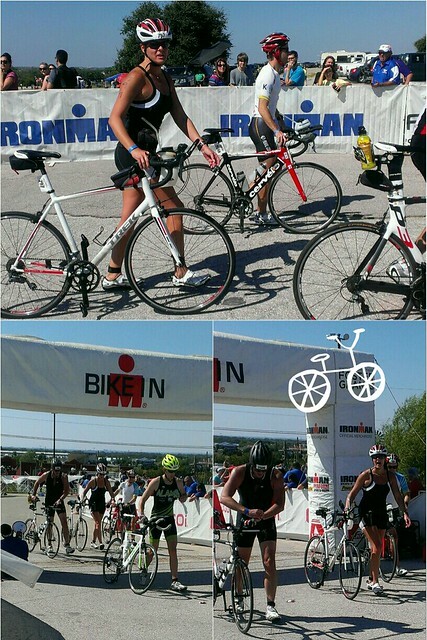 Nerves were high as Trish, Kim, and Brian prepared to take on their first 70.3 Ironman. I was confident that they'd love every second and I was thrilled to be a part of their special day... Friends, Ken, Justin, Jeffrey, and Charlie were also there racing. Needless to say, I had a lot of cheering to do! ~ I biked the course on Saturday and ensured that Trish felt extra confident. It was a great course! Some hills yes, challenging, but 100% doable. A few bumpy roads, gorgeous Texas countryside, and a slight headwind coming home. ~ My eyes were locked on the swim finish and I still managed to miss Trish coming out. Seriously, at 1hour and 17minutes I was panicking that she had pulled out. She had finished at 44minutes and 50seconds. Good grief! <---- worst sherpa/coach/friend award goes to yours truly. I did see Ken, Jeffrey, Kim, and Brian though. And having worked with Brian and his swim the last few weeks, I couldn't be more proud of his swim completion. Seriously y'all, this man ROCKED his swim that he was very fearful of. 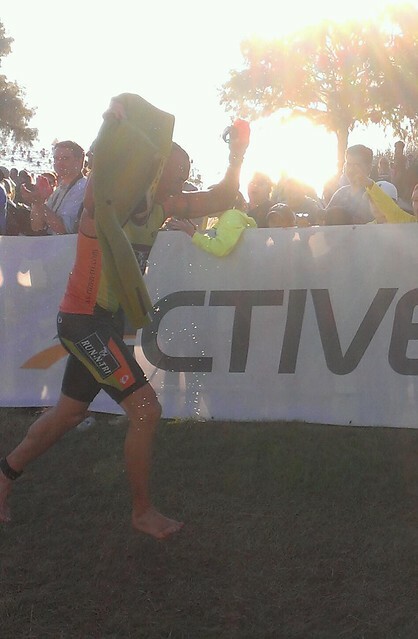 I love this about triathlon, it proves that you can do so much more than you think you can do. ~Was convinced that Trish paid someone to wear her chip since I missed her out of the swim and she's not returning from the bike. But aha, there she is. And smiling! (mostly) Yay! "I hate you for this!!" she exclaimed so very lovingly waving to me with her middle finger. But heading out on the run she looked and felt strong. Follow your plan girl and be flexible! ~Hung out with Kim's crew for a little bit - Anissa, Kathleen, Patty, Angie, and Kim's momma. All sweet and fun and funny. They fed me! (big hearts!) and let me chill in their shade. A good time to mention Austin had record high's today for October. Loved shaking some cowbells with these ladies though and cheering for Kim. ~So now everyone is running and I'm running. And I'm calculating and scheming and updating and just loving the whole vibe of Ironman. 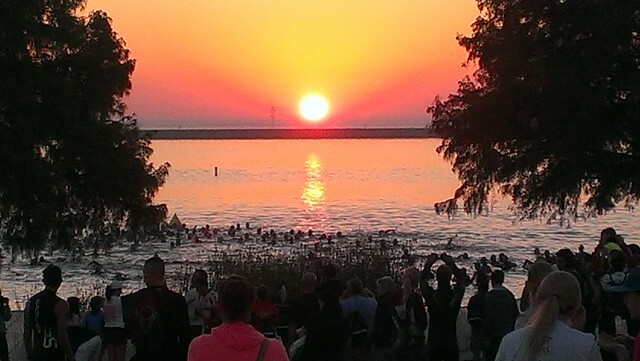 Have I mentioned how much I love triathlon and the Ironman atmosphere !? This is my life. I LOVE IT. ~So I spent the next several hours volunteering at the finish line handing out medals to all these beautiful Austin 70.3 finishers. Don't ask how I worked my way in there, but really, are you surprised? There is nothing as special as spending that moment with a finisher. Whether their first or 15th, you can FEEL the pride! (you can smell it too, phew!) I swear I get a contact buzz off of it though. Crying for strangers has never felt more right. Being able to be right there with Jeffrey, and then Brian, and then Justin, and then Trish as they crossed and celebrated their moment was so super cool! They make me SO proud. Truly astonishing. Each of my friends deserved every second of their finish. This was a challenging course and a hot hot day. ^ the MOST proud moment EVER! ^ the 2nd most proud moment EVER! ~Listening to race details from my friends. I love the good, the bad, and the ugly. They make me laugh and cry. Hearing them talk about their obstacles and how they overcame them, it impresses me, INSPIRES me! You can hear it in their voice, how proud they are. We are all meeting for lunch tomorrow to talk more. I can't wait!!!!!! 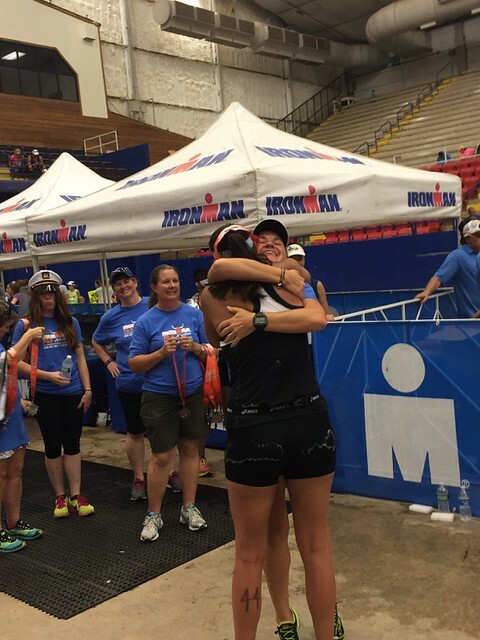 *dancing with excitement* And again, this is what makes triathlon so extremely rewarding. Everyone has their own story, their own goal, their own mental and physical challenges, and get something so unique out of the sport. ~Eating a cheeseburger and french fries with Trish after the race. If you know Trish, you'll understand why this is a highlight ;) And then hearing her screams in the shower. Ha ha ha, her poor feet are torn up! Ha ha ha ha!! I told ya, I love the good, the bad, AND the ugly. ~ Follow up lunch on Monday with Kim, mom, and Anissa, Trish, Jeanne and Brian. I love love LOVE hearing each of their perspectives of the race. I am so proud of each of them!! 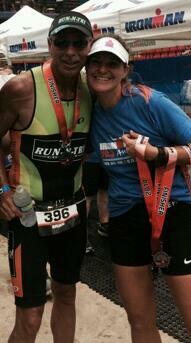 So, we've pretty much topped an amazing week/weekend in Austin with an amazing 70.3 DONE. I said it on Facebook, and I'll say it again, "... if there were nothing to struggle for, there would be nothing to be achieved. Where there is no struggle, there is no strength. TRUST your struggle. TRUST your strength. Swim, Bike, Run. And for the love of God, HAVE FUN."